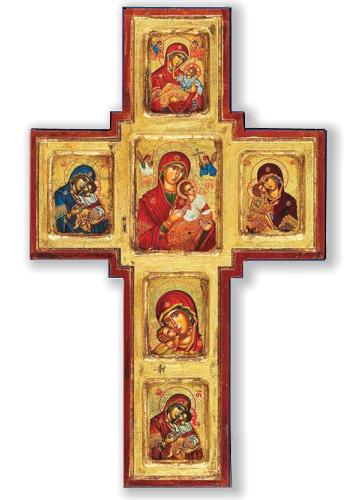 The third Sunday of Lent is called “The Veneration of the Cross.” At the Vigil of that day, after the Great Doxology, the Cross is brought in a solemn procession to the center of the church and remains there for the entire week— with a special rite of veneration following each service. It is noteworthy that the theme of the Cross which dominates the hymnology of that Sunday is developed in terms not of suffering but of victory and joy. More than that, the theme-songs (hirmoi) of the Sunday Canon are taken from the Paschal Service— “The Day of the Resurrection”— and the Canon is a paraphrase of the Easter Canon. The meaning of all this is clear. We are in Mid-Lent. One the one hand, the physical and spiritual effort, if it is serious and consistent, begins to be felt, its burden becomes more burdensome, our fatigue more evident. We need help and encouragement. On the other hand, having endured this fatigue, having climbed the mountain up to this point, we begin to see the end of our pilgrimage, and the rays of Easter grow in their intensity. Lent is our self-crucifixion, our experience, limited as it is, of Christ’s commandment heard in the Gospel lesson of that Sunday: “If any man would come after me, let him deny himself and take up his cross and follow me” (Mark 8:34). But we cannot take up our cross and follow Christ unless we have His Cross which He took up in order to save us. It is His Cross, not ours, that saves us. It is His Cross that gives not only meaning but also power to others. 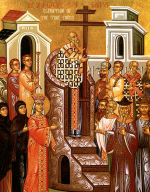 Learn more about the Veneration of the Cross on the Greek Orthodox website or the Antiochian Orthodox website. Listen to the podcast “Sunday of the Cross” by Fr. Thomas Hopko on the St. Peter’s website. Pre-Sanctified Liturgy on Wednesday, March 19 at 5:30pm. Salutations on Friday, March 21 at 5:30pm. We will look at Christian History up to the Great Schism of 1054AD. The lecture begins at 6pm at the Collier County Public Library on Orange Blossom and Airport Road (get map). We will holding the Forty Day Memorial for Rena Brooks this Sunday, March 23, 2014. Our prayers are extended to the family of Rena Brooks, particularly her daughters Christine and Susan and their families. 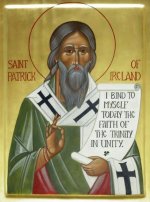 On Sunday during our discussion after Liturgy, I mentioned that St. Patrick was an Orthodox Saint. This caught many people by surprise. St. Patrick lived from 385 to 460. He was raised a Christian but took his faith for granted until he was exiled into slavery. That suffering compelled deep prayer and brought him closer to God. He received a vision as a young man that he would be freed and walked 200 to find the ship that would take him home and reunite him with his parents. He lived his faith with deep sobriety and commitment after returning home and after completing his education received another vision where he saw the people of Ireland calling for him. He returned and was a major figure in bringing Christianity to the land of his former captors. You can read the full story on the Orthodox Thought of the Day website. Reserve Palm Sunday (April 13, 2014) for the annual St. Peter Palm Sunday Brunch to be held at the home of Bob and Mary Jarvis Bob and Mary Jarvis (get map). Exact times to be announced. Our brunches and pot-lucks are good — low key with penty of rich conversation and fellowship. Also, the food is always exceptional. The Lord said, “If any man would come after Me, let him deny himself and take up his cross and follow Me. For whoever would save his life will lose it; and whoever loses his life for My sake and the Gospel’s will save it. For what does it profit a man, to gain the whole world and forfeit his soul? For what can a man give in return for his soul?